... that you study these lessons with your BIBLE! This is not a series of articles, nor a tract. Take your Bible. Turn to every reference given. The real LESSON you will learn must be learned FROM YOUR BIBLE. This quarterly merely asks questions and tells you where, in your Bible, to find the answer. You will get very little out of this Quarterly unless you turn to EVERY TEXT and read and STUDY, and meditate upon it. 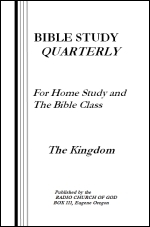 A copy of this Bible Study Quarterly will be sent free, while they last, to anyone requesting it for himself or herself. Or copies will be supplied, without charge, to groups, Bible-study classes, Sabbath or Sunday school classes — a copy for each member of the class — where these lessons will be used for study. 1. What was Jesus final commission to His followers? Mark 16:15. 2. Is it important that we find out what is the TRUE Gospel? Mark 16:16. Does this verse not say plainly that in order to be saved we must believe what Is preached THE GOSPEL? 3. Some say there are at least three Gospels — the Gospel of Jesus Christ; the Gospel of salvation; and the Gospel of the Kingdom. How many Gospels, besides the one which Paul preached, are right? Galatians 1:8-9. Notice a DOUBLE CURSE is pronounced — one in each verse. 5. Who was the Messenger of the Covenant, mentioned in the above verse? Mark 1:2. Did this Messenger do away with God's Commandments, and institute a new religion of His own? John 12:49; 14:24. Was Jesus SENT with a Message? 6. In the first sermon to Gentiles, Peter tells how to find WHAT MESSAGE He brought. Read Acts 10:36-37 answering these questions: (1) Who sent this word, or message? (2) To whom was it sent — to Gentiles? (3) By whom was it preached? (4) Where was it published or preached? (5) Where did he begin preaching it? (6) WHEN did this Message first begin? 7. Read Mark 1:14-15. (1) WHEN did this Message begin? (2) Who preached it? (3) From where did He begin preaching it? (4) WHAT WAS THE MESSAGE, sent from God, that he preached? 8. Compare Mark 1:1, with verse 14, last part. Is not the Gospel OF Jesus Christ the Gospel He preached? Is this not the Message God sent? And since Jesus is called the Messenger of the COVENANT, is this not the NEW COVENANT message? The Gospel Of Jesus Christ is the Gospel of the Kingdom! 9. We have seen the New Covenant Gospel was to start at a definite time — after John's ministry ended. Remember the term "Law and the Prophets" was customarily used to designate the writings we now call the Old Testament Scriptures. Read Luke 16:16. (1) What Gospel followed the Old Covenant? (2) Is the Gospel of the Kingdom still a FUTURE Gospel today, as some teach? 10. Did Jesus Command His ministers to preach this same Gospel? Luke 9:1-2; 10:1, 9. 11. What Gospel did the early evangelists preach? Acts 8:12; 20:25, 21; 28:30-31. 12. What Gospel is to be preached and published today? Matt. 24:14; Mark 13:10. SCRIPTURE READING: Galatians 3rd chapter. GOLDEN TEXT: Gal. 3:16, 29. 1. Read Romans 15:8, answering: (1) Does this text confirm that Jesus was sent as Minister to ISRAEL, rather than Gentiles? (2) Even though He brought a new Message, what did it confirm? (3) Since Christ's Gospel is based on the promise made to Abraham, does that not prove it was not a new religion? 2. Who were the fathers? Exodus 3:15; Acts 3:13. 3. Did the Lord command Abraham to do anything, before the promises became sure? Genesis 12:1-2; 17:1-2. 4. Were individuals of any other than the Hebrew race ever to be blessed by these promises? Gen. 12:3; 22:18. In this last verse to Whom does the word "seed" apply? Galatians 3:16. Through whom, must the promises be received? 7. Isaac and Jacob also were among "the fathers." Were the promises made also to them? Gen. 26:1-3; 35:9-12. 8. Since the promises pertain only to Israel, yet all nations are to blessed by them, how many individual Gentiles receive them? Gal. 3:28-29. 9. What hope has any Gentile, without becoming an adopted Israelite? Ephesians 2:11-12. How is a Gentile adopted? Verses 13, 19. 11. Abraham Kept God's Commandments, proving his Faith by his obedience. If we are his children, are we not commanded to do likewise? Gen, 18:17-19. SCRIPTURE READING: I Corinthians 15:12-58. EDITORS NOTE: Jesus came bearing a NEW message from God to man, which Message is the Good News of the Kingdom of God. In proclaiming this Gospel, He also came to confirm the promises made to Abraham, which promise was eternal inheritance of the land of Palestine, and eventually the whole earth, for Abraham and his children, through Christ. 1. Did Abraham ever, as yet, come into this eternal inheritance? Acts 7:2-5; Hebrews 11:8, 13. 3. Why did Abraham not, as yet, inherit the promise, and why are we only HEIRS at this time? I Cor. 15:50; John 3:3. 4. What is our ONLY HOPE of inheriting eternal life? I Cor. 15:12-18. Are those who have died IN CHRIST already perished, unless there is to be a resurrection? 5. When will the resurrection occur? I Thess. 4:16-17. 6. Will Abraham then come into his inheritance? Luke 13:28. 7. When will the Kingdom be inherited? Matt. 25:31, 34. 8. Will we, through the Gospel, inherit heaven, or the earth? Matt. 5:5; Psalm 37:9, 11, 22; Proverbs 10:30, 11:31. 9. Can sin (transgression of the law) enter the Kingdom? Rev. 21:27, 22:14. Is it not significant that the PROMISE of eternal inheritance was given to Abraham and his children because Abraham kept God's Commandments? 1. Did Jesus speak of the "Times of the Gentiles"? Luke 21:24. Does not the word "UNTIL" show that the "Times of the Gentiles" is a definite period, to end at a certain time, when Jerusalem would be delivered from Gentiles? 3. Did the Israelites AGREE to the proposal? Verses 7-8. Was this agreement entered into, and ratified by blood? Exodus 24:6-8. Did this agreement entered into between God and Israel constitute a covenant? V. 8. 4. The PROMISES of this agreement, which is called "the Old Covenant," are repeated in fuller detail in Leviticus 26:3-8. Do the promises include material wealth and prosperity? Would not a nation, a hundred of whose soldiers could put ten thousand enemies to flight, soon dominate the world and become a world Empire? Can you find any promise of the HOLY Spirit or of Eternal inheritance, included in this Old Covenant? 6. During Israel's punishment, how long was each day to represent in actual fulfillment? Ezekiel 4:4-6; Numbers 14:34. Notice this refers to Israel's punishment. 7. Did the Israelites keep their part of the Covenant? Ezek. 20:23-24. Did Sabbath-breaking have anything to do with their NATIONAL punishment for 2520 years, continuing through this dispensation of grace, even to our day? 8. In the second year of his reign, the Gentile King Nebuchadnezzar had a dream which God interpreted through Daniel. What was the purpose of the dream? Daniel 2:28. 9. Who gave the Gentile Nebuchadnezzar power to rule the world? Verses 36-38. Were the four kingdoms prophesied by this metalic image to be world-ruling empires? Verse 39. NOTE: We see, then, that the "Times of the Gentiles" are the 2520 years which God turned over to this succession of four Gentile kingdoms, to rule the world during the "Times" of punishment of Judah. Both the House of Israel and the House of Judah broke their covenant with God — failed to qualify under God's conditions to rule the world. Consequently this world rule, as God had said in Leviticus 26, was denied them, and turned over to their Gentile captors, for this 2520 — year duration. Israel was driven out first to Assyria in 721 B.C. But Judah had not yet broken the Covenant with God. The ''Times of the Gentiles" did not commence until Judah had sinned worse than Israel, and was taken captive by Babylon 604-580 B.C. Then it was that God turned world rule over to this Gentile succession for 2520 years. After this "seven TIMES" of the Gentiles has run its course, the Kingdom is to be restored to Israel (Acts 1:6-7 — but not to mortal, fleshly, rebellious, sinning Israelites. It will be RESTORED by the Second Coming of Christ, who the heavens have received UNTIL the TIMES of RESTORATION (Acts 3:21). In the meantime, the GOOD NEWS (Gospel) of that coming KINGDOM has been preached — The HOLY SPIRIT has come that "whosoever will" may be "born again" and enter into that coming world — KINGDOM. As we have seen, even Gentiles who are converted, through Christ become spiritually adopted as Israelites. It is this BORN AGAIN Israel — Israel of the SPIRIT — to whom the kingdom shall be restored by Christ at His second coming. We stand today at the very END of the "Times of the Gentiles." 10. After the "Times of the Gentiles." what is to happen? Dan. 2:44. Will Gentile governments such as Fascism, Communism, continue to rule then? Will the kingdom of God fill heaven, or the earth? Verse 35. 11. Who will rule with Christ? Daniel 7:18, 21-22, 27; Rev. 2:26-27; 3:21; 5:10. SCRIPTURE READING: Hebrews 8th Chapter. There is a popular teaching today which claims the Ten Commandments alone, constitute the Old Covenant. Therefore, because the Old Covenant is done away, they claim the Ten Commandments are abolished. They also says "The Old Covenant was made with ISRAEL, but we are not Israel," assuming the New Covenant is made with GENTILES. This popular teaching leads to the assumption that the Old was a harsh, cruel law (The Ten Commandments,) while the New is only with Gentiles and contains no law, but only PROMISES. The Old had law. The New has grace. The object of today's lesson is to search the Scriptures, whether this modern and popular teaching is correct. 1. Did God say He would make a NEW Covenant? Heb. 8:8. With whom did the Lord say He would make it — with Gentiles? 2. To whom do the COVENANTS, the glory, and the PROMISES pertain? Rom. 9:4. Has a Gentile, as such any hope, or is he a STRANGER to the covenants of promise? Eph. 2:11-12. In what manner can a Gentile come into the New Covenant relationship? Eph. 2:13; Gal. 3:29; Rom 11:17. 4. Was there a FAULT with the OLD Covenant? Verse 7. If something had not been AT FAULT with the OLD, would there have been a second? Then has not God proposed the second Covenant FOR THE VERY PURPOSE of correcting the FAULT with the Old? 5. If THE LAW constituted the Old Covenant, and there was nothing but the law connected with it, then the fault must be with the Law. This is exactly what the popular modern teaching assumes and therefore they tell us that, in order to correct the fault, Christ did away with His Father's Law. The Law came from GOD. Then would not impute the FAULT to God Himself? Was the LAW faulty? Psalm 19:7; Rom. 7:12, 14. Was it to be done away? Psalm 111:7-8. 6. What, then was the FAULT with the Old Covenant? Heb. 8:8, first phrase; verse 9, last phrase; Jer. 31:32 last phrase. 7. Under the Old Covenant God wrote His Law on two tables of stone; but the people were rebellious and never permitted the loving principles of that law to enter into their minds and hearts. How will God correct that fault in the New Covenant? Jer. 31:33. This was written in 606 B.C. What was God's law at that time? Read also Heb. 8:10; and 10:16. Do these texts say a DIFFERENT law, or a BETTER law will be written in our minds and hearts? 8. Under the Old Covenant, we saw in the _preceding lesson that the promises were purely Material and national — temporary inheritance of the land for THIS LIFE ALONE. What are the better promises of tile New Covenant? Heb. 9:15. 9. When is a Testament in force? Heb. 9:16-17. Did the Testator die? V. 28. 10. How may we become His HEIRS? Gal. 3:29; Mark 1:15; Acts 2:38; Rom. 8:9, 16-18. NOTE: The Greek word for "Covenant' is "Diatheke," which means Testament, or witnessed WILL by which one bequeaths his possessions after his death. A Covenant is defined as an AGREEMENT; or the conditional PROMISES of God. In the N. T. the Greek word is translated interchangeably, "covenant" and "testament." Our Inheritance from Christ is by a conditional Testament, involving an Agreement and therefore it becomes also a Covenant. SCRIPTURE READING: Romans 11th Chapter. GOLDEN TEXT: "God hath not cast away His people, which He foreknew." 2. Paul continues to compare the condition to that in the days of Elijah, when he thought all the millions in Israel had rejected God and bowed to Baal; but God showed him He had reserved 7,000 men who had not thus turned away. Was there a similar small portion of Israel in Paul's day who had accepted Christ and received Grace? Verse 5. 3. What happened to the rest of Israel, in this dispensation of grace? V. 7. 4. Who blinded them? Verse 8. If BLINDED, by a blindness imposed by God, would they be able to SEE the Truth, so they could receive salvation? 5. Back in the days before God blinded Israel, what did He do? Ezek. 20:10-11. 6. Besides giving Israel His law, statutes and judgments, and entering into the Old Covenant relationship with them, what else did the Lord do with a certain one of the Commandments? Verse 12. 7. After pleading in vain with rebellious Israel through succeeding generations to keep His laws, and hallow His Sabbaths, what did God finally do? Verse 23. WHY? Verse 24. Then what did He do? Verse 25. 8. What happened as a result of this blindness to Israel? Rom. 11:11. Why did salvation come to the Gentiles? — last phrase of same verse. 9. Was this blindness to last forever, or only UNTIL a certain time? Romans 11:25. 10. When that time comes, what shall happen to Israel? Verse 26. Answer (1) Who is the Deliverer to come? (2) Will not His coming be at the time when the fullness of the Gentiles has come in? 11. When Christ comes, and the blindness is removed from Israel's eyes, what does Isaiah say He will do? Isa. 11:11. What does Ezekiel say He will do? Ezek. 20:33-38. What does Jeremiah say? Jer. 50:4-5. 12. Through whose help and mercy will this salvation finally come to Israel? Romans 11:31. 13. It is a known fact that at least two thirds of the Gentiles on earth today have NEVER HEARD the only name by which we may be saved. Will those heathen who never heard have a chance in the millenium along with blinded Israel? Isa. 66:15-16, 19; Isa. 11:10; Micah 4:2. 14. Does the fact that those God blinded, and those who never heard, will be given their first chance in the millenium mean that we who have received the knowledge of the Truth, now will have a SECOND CHANCE then? Heb. 10:26-27. WHEN is the day of salvation for those who have received this knowledge? 2 Cor. 6:2. EDITORS NOTE: We hear much about the fact that Christ is soon to return to earth. We hear little about the PURPOSE of His coming. WHY is He coming? Is it (a) to DESTROY all unsaved people by the brightness of His coming, or (b) to meet US — the saints — as we start to heaven? Let us search the Scriptures. 1. Do the Scriptures teach that the same Jesus who trod the earth in human flesh shall ever return to earth? Acts 1:11; John 14:3. 2. Why did Jesus leave the earth and go to heaven? John 16:7; John 14:2; Luke 19:12. Here are three reason stated. What is the connection between them? 3. Jesus has gone to heaven UNTIL what time? Acts 3:20-21. NOTE: Dictionary definition of "restitution" is "the act of RESTORING something that has been taken away or lost. Restoration to a former condition or position." 4. When God finished Creation, was everything perfect and beautiful? Gen. 1:31. Did a CURSE come upon even the ground as a result of sin? Genesis 3:17-18. 5. Is it given of God for ALL people to UNDERSTAND the Gospel and be converted NOW, in this dispensation? Mark 4:11-12. 6. If those now called surrender and are converted, continue GROWING in grace and knowledge, overcoming sin, enduring trials and tests unto the end, will they be given a work to do in the restoration of truth, peace, righteousness, and happiness through the Kingdom age? Rev. 2.26-27, 3.21; 1 Cor. 6.2. 7. Will some be "kings" — ruling politically, one over ten cities, another over five, etc., — while others are "priests," ministering the TRUTH and salvation? Rev. 5:10. Where does this say we shall thus reign? 8. When Jesus comes TO RESTORE, what will happen to false preachers? Ezekiel 34:10-12. 9. When Jesus comes, what will happen to the kingdoms and governments of this world? Rev. 11:15, 19:15-16; Dan. 2:44. 10. Is the KINGDOM the PLACE Jesus went to prepare? Matt. 25:34; Rev. 21:2. Does the New Jerusalem come down FROM heaven, to us, PREPARED? 1. How long shall the saints made kings and priests in the first resurrection reign with Christ? Rev. 20:4, 6. 2. Jesus said that if He went to heaven, He would COME AGAIN. At the coming, does the Scripture say He is coming TO MEET THE SAINTS, as they start to heaven, or does it say they are resurrected from their graves and are caught up to MEET HIM, as He is returning? I Thess. 4:16-17. After meeting Him in the air, how long shall we BE with Him? Verse 17, last phrase. 3. Where shall we reign with Him? Rev. 5:10. 4. In reigning with Him for this thousand years, WHOSE THRONE will we be sitting on? Rev. 3:21. Where does this say Jesus is sitting NOW? 5. Where is the throne of God the FATHER? Matt. 5:34. If Jesus had a throne of His own IN HEAVEN, making TWO thrones in heaven, would not that make heaven a kingdom divided against itself, which could not stand? 6. What throne shall be given to Christ to be His own throne? Luke 1:32. Is the throne of David, which shall become Christ's throne, in heaven or on earth? Then where will the throne be, on which we shall sit with Him a thousand years? 7. When we reign with Christ for a thousand years who shall we reign over? Rev. 22:26-27. Do you think this indicates DEAD nations that had previously been destroyed at Christ's coming? 8. We have seen in past lessons that God gave over the reign of the earth to the Gentile nations for 2520 years, which reign is pictured and prophesied to us by Nebuchadnezzar's IMAGE, and Daniel's four BEASTS. When, at the end of the Times of the Gentiles, Christ, the Stone, smites this image on the feet, what place does His Kingdom fill? Dan. 2:35. Is this the Kingdom of God, and does it fill the earth a thousand years AFTER the days of these Gentile kings? Verse 44. 9. How long does the "little horn" or ROME, make war against, and prevail against the saints? Dan. 7:21-22. Is the Kingdom they possess in heaven, or under it? Verse 27. 10. When Jesus comes, during the battle of Armageddon, when Jerusalem shall be taken, does He return to heaven, or where does He go THAT SAME DAY? Zech. 14:1-4 (first part of verse 4). What shall go out from Jerusalem from THAT DAY? Verse 8. Will the Lord be king over heaven, or over earth in that day? Verse 9. Will the land be desolate and uninhabited? Verse 10-11. What happens from year to year thereafter, and will Gentiles and sinners be there? Verses 16-19. 11. Read Isa. 11:6-8. Will wild animals be tamed BEFORE the millenium? Will there be nursing babies, and weaned babies in the New Earth AFTER the thousand years? Then where shall we place this condition of tame wolves, leopards, lions, and snakes playing with babies? Verse 9. 12. What else will happen in THAT DAY? Verses 10-11. Can these events be BEFORE the millenium? Can they be AFTER the millenium? And if they MUST BE DURING THE MILLENIUM, could we have these animals in heaven, with Gentiles seeking salvation, and babies being born? This condition must be DURING the millenium, and must be ON THE EARTH. 13. Shall the righteous ever be removed from the earth? Prov. 10:30. WHAT HAPPENS TO THE UNSAVED AT CHRIST'S COMING? SCRIPTURE READING: Jeremiah 4th Chapter. GOLDEN TEXT: "And it shall be in that day, that living waters shall go out from Jerusalem;... and men shall dwell in it, and there shall be no more utter destruction; but Jerusalem shall be safely inhabited." Zech. 14:8, 11. FOR HOME READING, PRIOR TO CLASS: Read through the first four chapters of the Book of Jeremiah. Notice that, (1) Jeremiah's commission, as God's intermediary between Judah and Babylon in the Jew's captivity was to root out, pull down, destroy, and throw down the throne of David, and the Kingdom of Judah (Jer. 1:10); and (2nd), beginning verse 11, chapter 1, the Lord reveals and sets him a prophet to warn the Jews of how the Gentile kingdom of Babylon, to the North, will capture Judah, destroy her cities, leaving the land of Palestine desolate and uninhabited. This captivity and destruction occurred between 604 and 585 B. C.
1. There is a teaching that all the wicked, or unsaved people, shall be destroyed by the brightness of Christ's coming. This teaching is based on 2 Thess. 2:8. (1), What is the word before "Wicked"? (2), How many people does this include? (3), What is to happen to that Wicked man, as indicated by the two words after the word "Wicked"? 2. What is this person to be "REVEALED" called in verse 3? What will this wicked man of sin do? Verse 4. Is the fact that this wicked man of sin shall be REVEALED again repeated? Verse 6. Is not the man to be REVEALED called the man of sin, and also called "that wicked?" Are they not the same man? 9. Then how many people does verse 8 say shall be destroyed by the brightness of Christ's coming? 4. This same teaching represents Jeremiah 4:23-27 to declare that the whole earth will be desolate and uninhabited during the thousand years. To whom is the message of this chapter addressed? Jer. 4:3, 5. 5. What land is to be laid desolate, which cities laid waste and without an inhabitant? Verse 7. (N0TE: The "destroyer of the Gentiles" refers to King Nebuchadnezzar of Babylon, who took the Jews captive 604-585 B.C. 6. Again which cities are to be made desolate and unhabited? Verse 16. Why is Jerusalem and Judah to be thus destroyed? Verse 17. How much of the land of Judah is to be SPOILED or laid waste in war? Verse 20. 7. Now read verse 23-27. Is it not plain that this is referring to the same cities noted in the above verses — Judah and Jerusalem, in the captivity of 604-585 B.C.? (NOTE: "the fruitful place" refers to Palestine in the Scriptures). Compare "the cities thereof," in verse 26 with those of verse 16, last part. Are they not the same? 8. Was this destruction a SPOILING, in WAR, or a supernatural destruction such as some describe at Christ's coming? Verse 30, first part. 9. Was not the destruction described by Jeremiah that of the land of Judah at the captivity, 600 years before Christ, rather than the whole earth during the coming millenium? Jer. 25:3-4, 7-9. 10. IN THE DAY OF THE LORD, will SPOIL, of war be divided in the midst of Jerusalem? Zech. 14:1. Is this the battle of Armageddon, when ALL NATIONS shall fight against Jerusalem? Verse 2. Will His feet touch the earth at that time? Verse 4, first part. 11. What shall go out from Jerusalem, in summer and winter, FROM THAT DAY? Verse 8. What do "living waters" mean? John 4:10, 14 and John 7:38-39. 12. Who will be king over the earth IN THAT DAY? Verse 9. 13. In the years and months following Christ's coming, will the Holy Land be inhabited? Verses 10-11. 14. Of the nations who fight at Armageddon, what will happen to those left and not killed in the war? Will they be destroyed by Christ's coming? Verse 16. Will HEATHEN continue on earth after that time? Verse 17-18. 15. Who shall reign over these heathen, ministering the living waters of salvation during the millenium? Rev. 2:26-27, 5:10. GOLDEN TEXT: I Corinthians 15:50. 1. Did Jesus preach the Good News of the KINGDOM OF GOD? Mark 1:14. 2. When He began preaching this News, after John was put in prison, was a set time fulfilled? Mark 1:15, first part. 3. Was a certain definite TIME determined to "anoint the most Holy," at which time Christ's ministry began? Daniel 9:24-25. Did God send His Son with this KINGDOM message when a certain TIME was fulfilled? Gal. 4:4. 4. At this set time for Christ's preaching of the Kingdom message to begin, was the Kingdom then AT HAND? Mark 1:15. When Jesus was asked when the Kingdom should come, what did He say? Luke 17:21. 5. Is it possible for flesh-and-blood people, such as are in churches today, to have inherited the KINGDOM already? I Cor. 15:50. 6. What is it, now WITHIN US, that guarantees our resurrection to immortality and inheritance of the Kingdom? Rom. 8:11. 7. Some had the idea that the Kingdom should appear in Jesus' day. Did He correct that error? Luke 19:11-12. 8. Did Jesus set up the Kingdom? Acts 1:6-7. 9. Did Jesus elsewhere say we could not know the exact time of setting up the Kingdom? Matt. 24:36. Yet, what are we to KNOW from present-day events? Luke 21:31. 10. What three men are certain to be in the Kingdom? Luke 13:28. Are these men yet resurrected? Are they today in the Church? 11. When God's Kingdom is set up, what will it do to present Gentile kingdoms? Daniel 2:44. Has the Church done this? 12. While the CHURCH is not the Kingdom, yet what shall the SAINTS who compose the Church eventually do? Dan. 7:18, 21-22, 27. 13. WHEN shall those who are saved inherit the Kingdom? Matt. 25:31, 34. 1. What do the Scriptures tell us the Church is? Eph. 1:22-23; 1 Cor. 12:27. 2. Who is the HEAD of this Body? Col. 1:18. In what manner is Christ head of the true Church of God? Eph. 5:23. 3. How did the Church of God come to be CHRIST'S body, thus belonging to Him — did He PURCHASE it, ­ and how? Acts 20:28. Do you think He purchased some one religious organization with His blood? Since it is individual sinners, not organizations. who have forgiveness through His blood, do not the Scriptures plainly teach that THE CHURCH OF GOD is that body of individuals whose names are written in heaven, instead of some organization? 4. What are those in the true Church, members of? Eph. 5:30. Can we become members of His Body by merely accepting so many points of doctrine approved by a board of men, and then joining an organization? Acts. 2:47. How are we PUT INTO, or baptized into the true Church of God? 1 Cor. 12:13. Can we be Christ's and members of His Body without the Holy Spirit, even though we join an organization and accept its doctrine? Rom. 8:9. How many churches does God recognize? 1 Cor. 12:12, 20. 5. What was the prophesied course of religious organizations claiming to be the true Christian Church? 2 Thess. 2:3; 2 Tim. 4:3-4; Acts 20:29-30. 6. Whom did the Devil persecute? Rev. 12:17. What happened to the saints who make up the true Church? Rev. 12:6. Was the apostate church small or great? Rev. 17:1. 7. Have these church organizations saved the world? Ezek. 34:2, 4-6. 8. Will those who have not heard, or have been blinded through this dispensation, be sought out and given a chance of salvation when Christ comes? Ezek. 34:11-12; Isa. 11:10-11; Rom. 11:26. 9. Which did Christ ordain, that all should be saved, or only that the Kingdom Message should be preached in all nations merely For a Witness before the end of this dispensation? Matt. 24:14. During this dispensation, is it given to all to come to a knowledge of the truth? Mark 4:11-12; Matt. 13:11-13. 12. In assembling for worship and mutual edification, as well as our labors of spreading the Gospel, what is the Bible basis for unity, and the test of fellowship? John 13:35; Eph. 4:16. If we have the LOVE OF GOD shed in our hearts by the Holy Spirit, do we not also have the Spirit which leads into TRUTH? Then is not LOVE more essential than DOCTRINE as voted by a few men who rule? SCRIPTURE READING: Hebrews 12th Chapter. GOLDEN TEXT: 2 Peter 3:18. 1. We have seen in past lessons that only a comparative FEW are called to salvation in this dispensation. Most of Israel is blinded spiritually, and the majority of the heathen have never heard When Christ, the Deliverer, comes again and sets His hand again the second time to recover His people, removing their blindness, will we who are called to salvation in this time have any part in their salvation? Rom. 11:31. Will the saints now saved minister then as priests only, or will some rule politically, as kings. Rev. 5:10. 2. In order to rule with Christ through the millenium, is there any overcoming, and enduring required through this life? Rev. 2:26-27, 3:21. 3. For those saved in this dispensation, is not just acceptance of Christ ALONE enough, as so many teach? Or is some DOING also necessary? Matthew 7:21. 4. Is it possible to profess Christ as Saviour, and worship Him, honoring Him with words of testimony in meeting, and still be unsaved and worshiping in vain? Mark 7:6-8. Must the Christian GROW in grace, and in knowledge, thus showing gain and progress in his Christian life, in order to be saved and become a king or a priest in the Kingdom? 2 Peter 3:18. Must he endure? Matt. 24:13. 5. What must the Christian do, in order to be cleansed of sin, sanctified and made holy so as to qualify for the responsibility of a position as priest or king in the Kingdom? 1 John 1:9. What else? Rom. 12:1. Our bodies are to be the temple of the Holy Spirit. If we present them to Christ, will He come into this temple? Rev. 3:20 and Eph. 3:17. 6. Before we surrendered, repented and received Him, through His Spirit within, were we clean and pure? Rom. 3:23. When He comes inside, will He clean house? Eph. 5:26. Must our own self-will be crucified, and submissive, in order to permit Him to cleanse us? Rom. 6:6, and Gal. 2:20. (NOTE: A crucified man is not necessarily a dead man, but is nailed up to a tree where he cannot spring down as he would like. Thus we present our bodies not a DEAD, but a LIVING sacrifice — crucified, yet alive ­ submissive to HIS will. 7. When we thus submit to God, and Jesus our High Priest takes possession inside, through the indwelling of the Holy Spirit, — what is our relationship to God? Isa. 64:8. As God then cleans out the spiritual dirt in our hearts and lives, cleanses, purifies, and molds our lives into an altogether different vessel as a potter would the clay, must we undergo some chastening at His hands? Heb. 12:5. Is this a sign of God's LOVE? Verse 6. 8. What should we remember when we suffer also persecution at the hands of other people? John 15:20 and 2 Tim. 3:12. Must we also suffer tribulation? Acts 14:22. What is God's purpose in permitting all this trial, and test, persecution, tribulation, and chastening? Heb. 12:11. 9. When Jesus returns to set up the Kingdom, will we who are now being saved, and entrusted with the spiritual "pounds" be called to accounting? Luke 19:12, 15. Will the one who GROWS in grace and knowledge and in overcoming ten-fold receive a greater responsibility in the Kingdom than one who gained only 5? Verse 16-19. What will happen to the professing Christian who tells about the day when he "got saved," but has not grown spiritually, or been fitted or prepared by His Christian life for Kingdom responsibility? Verses 20, 24. 10. What, besides utter surrender, must the Christian do DAILY, in order to overcome, grow in grace and knowledge, endure unto the end, and fit himself for a position of responsibility in the Kingdom? 2 Tim. 2:15; 1 Thess. 5:17. What must he do at least once a week whenever at all possible. Heb. 10:25. NOTE: The OBJECT of the Christian life is to prepare us for positions of RESPONSIBILITY in the Kingdom. Then Christ will rule the nations of earth as King of Kings. Then He will put down all false religions and false preachers, and be Lord of Lords. The Saints shall possess the kingdom and rule with Christ when the Kingdoms of this world become the kingdoms of our Lord and His Christ. Kings, Presidents, Dictators, have failed in ruling the nations. Preachers have not spread the true Gospel. The world is today such a babylon, with hundreds of different sects that many throw up their hands in bewilderment and disgust, not knowing what to believe and so accepting no religion. The one Object and Purpose of the Christian life in THIS DISPENSATION is to prepare and train men and women to be qualified for positions of high responsibilities as King and priests under Christ, during the millenium.